Red velvet cake is as striking visually as it is delicious. 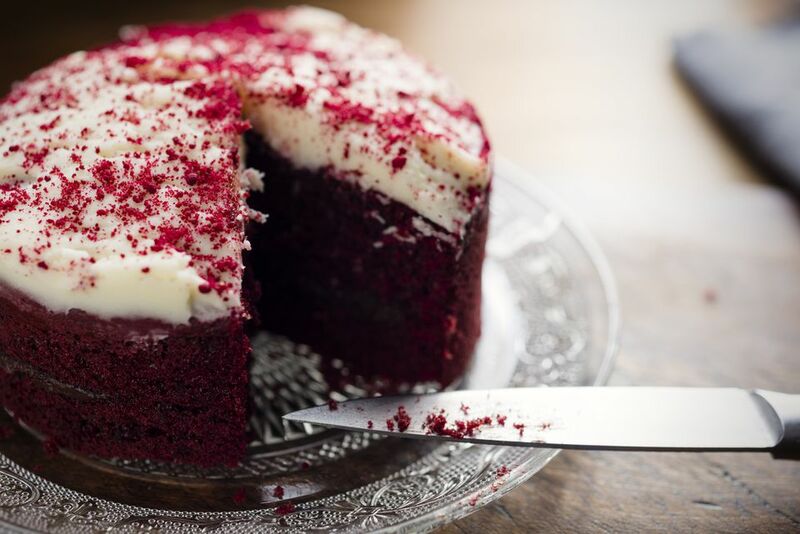 There's just something about that deep, red cake against the cream cheese frosting. Mixing the baking soda with the vinegar is an interesting technique that you don't see very often in cakes, but its purpose is to generate extra rising power. And you really need to make sure your baking soda is fresh. Butter and flour two 9-inch cake pans. It can help to line the bottom with a circle of parchment paper cut to fit the pan. In a large mixing bowl, stir together the flour, cocoa, and salt until blended. In the bowl of a stand mixer fitted with the paddle attachment, combine the eggs, oil, sugar, vanilla and red food coloring. Beat on medium speed until fluffy. Now add some of the dry ingredients to the egg-sugar mixture while the machine is running. When it's fully incorporated, add some of the buttermilk. Continue alternating adding the dry ingredients with the buttermilk until it's all incorporated and the batter is smooth, scraping down the side of the bowl as you go. In a small bowl, mix together the vinegar and baking soda, and when it foams, mix it into your batter. You're going to want to move quickly, though. Mix it in just until it's combined, about ten seconds. Then pour the batter into your prepared pans and transfer them to the oven. Bake for about 30 minutes or until a toothpick inserted into the center comes out clean, or with a crumb or two attached. You can start testing after 28 minutes because it's better to check too soon than to overbake. Cool the cakes for 10 minutes in the pans on a wire rack, then loosen the edges by running a knife along the sides, turn the cakes out onto the racks and cool for at least another hour, and then refrigerate (wrapped in plastic) for at least an hour before frosting with this cream cheese frosting.